I participated in this year’s Buckeye Game Fest No-Ship Math Trade and the results are in! For those of you that are unfamiliar with Math Trades, users submit to a large list, the games they’re willing to trade away. After submissions are closed, all users use a software tool to assign games they’ve put in the trade as candidates for trading for other games on the list. 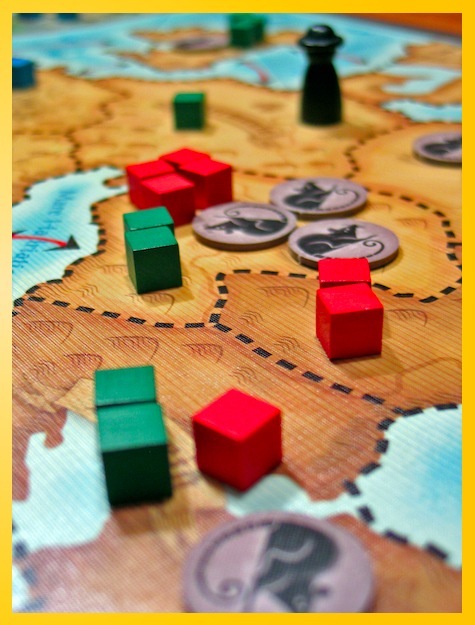 If you have a game in the list and you can’t find another game on the list you’re willing to trade for it, then you just get your game back risk free. After everyone assigns the games their willing to trade for other games, a trade maximizer tool is used to determine the largest number of N-way trades possible. Since they’re N-way trades, you may trade a game to another user but receive the game you wanted for it from a different user. This year some 32 users put 338 games on the list! No-ship Math Trades occur usually at board game conventions where participants are already gathering and there’s no shipping involved. This year I entered 14 games into the trade and came away trading 5. All in all I’m happy with the trades and thank zefquaavius a.k.a. Nathan Morse for going through the trouble of hosting it again this year. And sorry, Nathan, that you missed out of my copy of Witch’s Brew. Not much to report yet. Still reading through rules and getting a feel for the games. Lisa and I have gotten in a few more games of Jaipur in the last few days and what a great, but maddening, game! I think out of the 9 or 12 hands we’ve played, I may have won 2 or 3. It seems any time I take camels or take a single card, the cards I need come up and Lisa takes them. Happens over and over. Arg! Lisa, Noah, and I played Forbidden Island last night and had a good time. Matt has taken Pandemic and poured it into a lighter, shorter, and more family-style cooperative game. 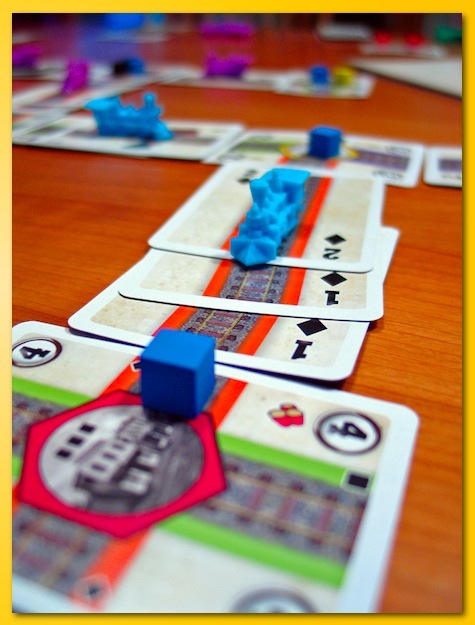 Although there is no theme to the game, or rather, the theme could have been just about anything, if you like Pandemic but sometimes are looking for something lighter and easier to teach…well you’ve found it with Forbidden City. 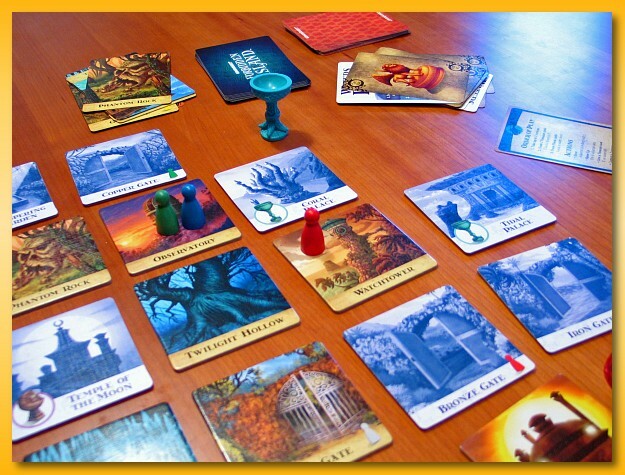 Players take roles and move around a grid of tiles in an attempt to work together to collect like colored cards that represent the four “treasures” of the island. 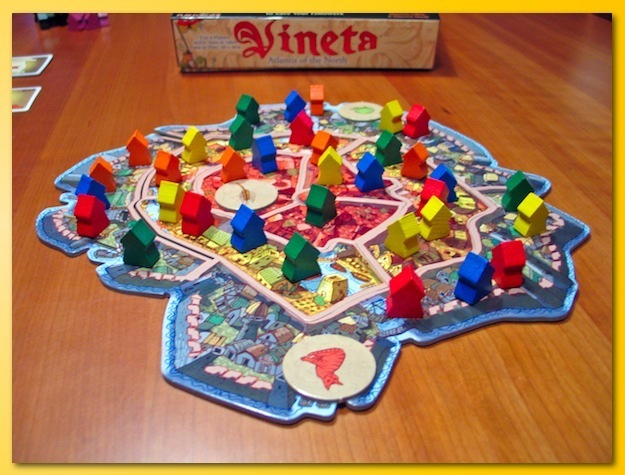 Like Pandemic, after each players turn, the game takes a shot at causing tiles to sink (taking them out of the game) and to throw up obstacles for you to navigate. Players must work together to “heal” flooded parts of the island so that treasure spots stay open as well as the ability to navigate to the exit point (a helicopter pad.) All in all, it is a light game played with your cards face-up, which frankly is how we played Pandemic. I have a game day/night coming up tomorrow over Labor Day and I broke out Macao to go through the rules. I’d only meant to play a few rounds solo (playing three different players) but found myself playing an entire game. The game feels a bit odd at first…random. Pairs of cards are dealt out to 12 different locations around the board and then each round a single pair is flipped up alone with additional cards from a draw deck. Small numbers on the cards are summed to determine how much victory points cost this round and then players take turns choosing a single card to add to their tableau. The cards have special abilities on them but you don’t get to make use of them when the cards are on your tableau. It’s only when you activate the card does it start to pay dividends. After cards are taken (you can only have so many unactivated cards before it starts costing you victory points) 6 uniquely colored dice are rolled and players in turn get to pick two dice and choose the corresponding number of cubes (of a matching color as the dice) that are shown on the pips. The cubes are placed around 7-sided “wheel” that depicts the six die faces and an arrow. Once you place your cubes the wheel is turned one “click” and the arrow will point to a batch of cubes (hopefully). 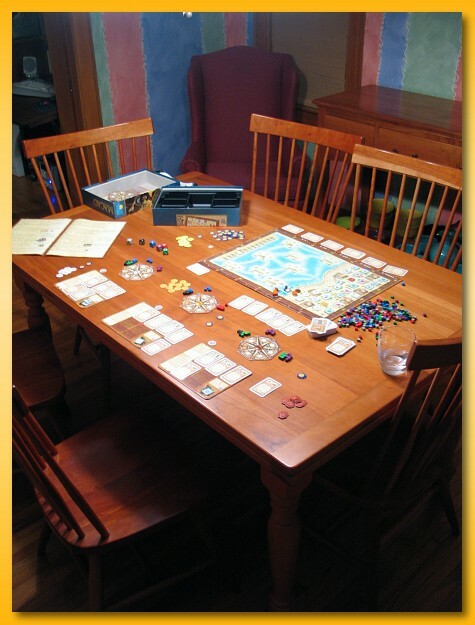 It’s from this batch of cubes that players take their turn allowing players to use those cubes to activate cards from the tableau, move ships, take control of city spaces (obtaining goods to be delivered by ship), obtain gold, use gold to buy victory points, and “tap” activated cards to take the actions described on the card. Some cards are only used at game end granting the player points for meeting specified goals. The first third of the game felt oddly mechanical and a bit slow going but by the end I felt invigorated to maximize my turn. Playing three players at once is a challenge given the numerous cards and how they interact. Keeping track of what you’ve tapped each round can be problematic. I also suspect that slow players will really bog down play as each turn will get more and more complicated to resolve given more activated cards. Although it seems I’ve pretty much poo-pooed the game, I am looking forward to playing it with my game group. As with most games, the fun is with the people more than the game. Looking forward to my first play tomorrow.